This second installment in a three-part series on validation and technical transfer in the biopharmaceutical industry presents a generalized example that shows how a validation plan might be developed to support a process. While the example is not related to biopharmaceutical manufacture, it demonstrates various points to consider related to the inputs, the processing system, and the outputs that can be applied to biopharmaceutical processes and systems. The intent is to think outside the box and avoid terminology traps that hinder many validation efforts. Part 1 of this series, which appeared in the April 2018 issue of this publication, contained a brief history of validation and defined the terms process and validation to provide context (1). Inputs include water and coffee. The processing system is the coffee brewer and the coffee grinder. The outputs are brewed coffee and process waste: coffee grounds and used filters. tasters prefer to obtain a definition of “good-tasting coffee.” To have a meaningful result, the brewed coffee used in the study must be produced in some standardized way not only to achieve reproducible tasting results but to enable the ultimately chosen brewing process to be validated and to produce coffee equivalent to that used in the tasting study. The obvious analogy is a clinical trial followed by subsequent commercial-scale production of a biopharmaceutical product. The process inputs are water and coffee; but what type of coffee is selected and how is it roasted and ground? Should the coffee be a blend, or should it be a single type? If a blend is desired, what types should be used and in what proportion? Should the coffee be sourced from various growing regions or should it be single-sourced? What level of roast should be used: light, medium, dark? How will the roasting be controlled? How will the beans be ground, and to what degree? Should there be a maximum time allowed between grinding and brewing? Will tap water be used, or should some form of processed or filtered water be considered? These decisions impact the process and must be carefully considered. Some process variables are more critical than others. Even in this simple example, there are many factors to consider, and biopharmaceutical processing is much more complex. An Ishikawa (fishbone) diagram is a helpful tool for visualizing processes and process inputs. Figure 1 is an example applied to coffee brewing. Figure 1. 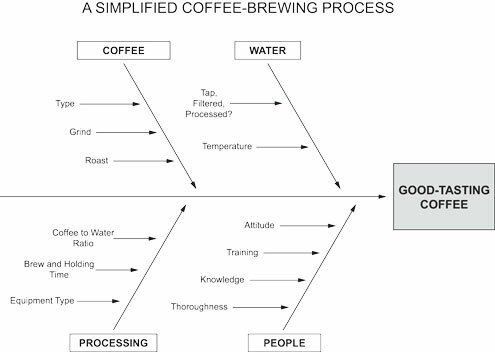 Fishbone diagram of a simplified coffee-brewing process. Once the decisions have been made with respect to the coffee and water, supported by evidence from the tasting trials, the brewing process can be considered. Data from how the coffee used in the tasting studies was prepared serve as the basis for developing and validating the brewing process. Wherever possible, quantitative values should be established and documented so they can be used for process execution and further evaluation. Equipment make, type, model, and serial number should be documented. The brewing process must be carefully assessed before validation can begin. What brewing process will be used—percolation, drip, vacuum, or French press? Assuming the coffee type and grind have been determined, what brewing ratio, coffee-to-water, will be used? How long will the brewing cycle be? How will it be timed? What water temperature will be used, and when and how will that temperature be measured and controlled? What, if any, type of filter is employed? How will the brewing equipment be cleaned and when? Will detergents be used? If so, what duration and type of rinsing will be used to remove detergent residues? The coffee brewed for the tasting studies will have been prepared in some controlled manner using identifiable coffee type, roast, and grind, and processed in equipment that will serve as the basis for selecting equipment for the commercial brewing process. Once the choice of equipment has been finalized, the equipment must be qualified with respect to its operational parameters. What brew settings are available? Which ones have a critical impact on the taste of the brewed coffee? How reproducible are the settings, and how accurate? With respect to the coffee grinder, how is the fineness of the grind determined and set? How reproducible are the settings? What is the uniformity of the grind? Does it contain a high proportion of “fines” or large particles? What are the capacities of the brewer and grinder and do they match the expected coffee shop volume? Finally, the process output must be examined and evaluated. Does the brewed coffee taste good? How will that be determined? Is it the same as the coffee chosen as a result of the taste testing? Are there any analytical methods that might provide confirmation? At what temperature should the coffee be held, and for how long? How should it be served, in a paper cup, foam cup, or china? Does the cup require insulation? Will take-out be available? If reusable, how will the cups be washed? Are coffee stains or detergent residue issues? Once these variables have been defined, examined, and evaluated, the validation study can begin. A single validation protocol can cover the entire process or, more usefully, the process can be broken down into several manageable steps with individual protocols for each. Validation protocols should describe the intended process, define the acceptance criteria, and set forth the procedures and tests that will be used to demonstrate that the process does what it is intended to do and results in an output that meets the predetermined acceptance criteria. Ideally, the protocol should be written by those most familiar with the process to be validated, with input from other organizational units as necessary and appropriate. Development, process engineering, production, and regulatory affairs departments should almost always be involved. Other departments that might have input are purchasing, warehousing, and compliance. 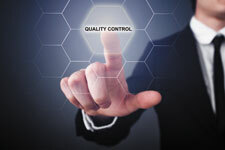 The quality assurance department must be involved at all phases of protocol development and must approve the final protocol before validation begins. Protocols fit two broad categories. Qualification protocols are used for process equipment, such as tanks, mills, piping systems, autoclaves, ion exchange units, chromatography columns, and stopper washers. Validation protocols are used for processes that employ the qualified equipment and for processes related to the equipment, such as cleaning and sterilization. It is convenient to break down equipment qualification into several steps such as design, installation, and operational as described below for the coffee brewing example. Tasting studies may have shown that customers preferred coffee produced by pouring hot water through ground coffee supported on a filter. The proportions of coffee and water as well as the coffee type and grind, filter type, the brewing time, and the temperature were known from the development studies used to support the tasting. Adequate design qualification used in equipment selection will ensure the commercial brewer and grinder will meet the process requirements established during development. Factors to be considered include materials of construction, ease of use, space requirements, utilities, and process interactions (e.g., compatibility, adsorption, and leachables), and cleaning and maintenance. Once selected, the equipment is installed, ensuring that electrical and water supplies are available and adequate and that necessary operational and storage space for supplies is convenient and available. The shop must be set up and arranged to optimize workflow. Space and facilities for equipment cleaning must also be available. Processing settings and conditions must be checked and calibration of water temperature, flow rate controls, and timers must be accomplished and documented. Cleaning procedures must be performed and evaluated for effectiveness and any problems corrected. The installed and qualified equipment may then be used in start-up and training exercises to ensure everything, including coffee shop staff, is ready for a successful opening day. Validation of the coffee brewing process may take place during the operational phase of equipment qualification, although the validation studies extend backward and forward in time. Earlier activities include vendor qualification of the coffee supplier and roaster, qualification and validation of the water supply system, validation of the equipment cleaning processes, and any calibration programs and maintenance procedures. Later activities include periodic evaluations to ensure the brewing process is functioning as intended, evaluation of cleaning and maintenance procedures to ensure adequate frequency and effectiveness, and a review to determine whether any operational issues or employee training programs need to be adjusted. This good-tasting coffee example is intended to stimulate thinking about the important points to consider when developing and marketing a product that consistently meets customer expectations. Although the product in question, good-tasting coffee, is not a biopharmaceutical, the same validation principles apply. The validated process must be robust, consistent, and do what it is intended to do. Part 3 of this series will discuss validation of a non-traditional biopharmaceutical process, lifecycle, and change management and offers a summarization of the benefits of well-conceived and executed process validation studies. 1. R. Madsen, BioPharm International 31 (4) 26-30 (April 2018).